"The roots of the Northern Bohemian glass industry and the glass-maker family Friedrich"
Northern Bohemia still retains some secrets! For centuries they have lain dormant in the native soil. Now Czech archaeologists have brought them to light. The book "The roots of the Northern Bohemian glass industry and the glass-maker family Friedrich" discloses them in German for the first time. The author has linked the jigsaw pieces of archaeology with those of nomenclature, documents and historical facts to form a fascinating picture of the centuries-old German-Bohemian tradition of glass art. For it was German pioneers of glass-manufacturing who cleared woodland in the Lusatian Mountains around the year 1250 and built glassworks, also known as glass huts. From as early as 750 years ago, the shadowy picture of the oldest German-Bohemian glass-maker family Friedrich emerges, who contributed greatly towards the creation of the world-famous "Bohemian glass". In pre-Hussite times they produced amazing works of vitreous art near Daubitz, nowadays called Doubice. 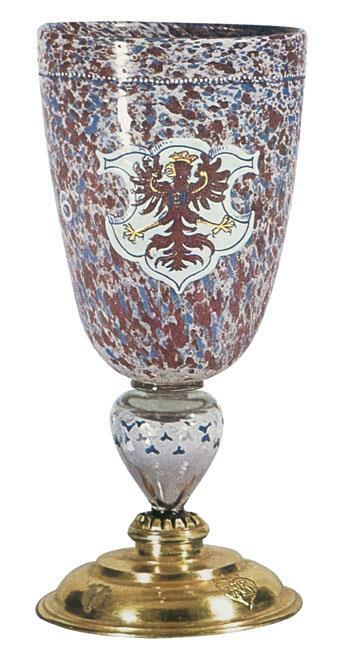 During the 16th and 17th centuries, as a result of the family’s development of their glass factory in Oberkreibitz, today Horní Chribská, Bohemian glass art enjoyed its first heyday. The history of this glass hut has never been portrayed in such detail as in this book. Moreover, the unparalleled expansion of this glass-maker family over many European countries has never before been so comprehensively described. Its hut master dynasties made glass history in Bohemia, Silesia, Austria, Tyrol and Slovenia. Its glass-makers proved their artistic skills and technological experience in Brandenburg, Saxony, Thuringia, Bavaria, Styria, Slovakia, Croatia and so on. The well-known glass artist Friedrich Egermann also ranked among the family’s descendants. The striving of the researchers for new discoveries, the characters and fates of the glass masters, the everyday life of the ancestors: everything is described in an exciting and lively manner. This extensive monograph closes a gap in the history of European glass. It is a book that is most interesting for glass lovers, for people interested in history, especially in the history of Bohemia, and for genealogists alike. Price: 28,00 EUR plus 5,00 EUR postage and packing for orders from abroad.